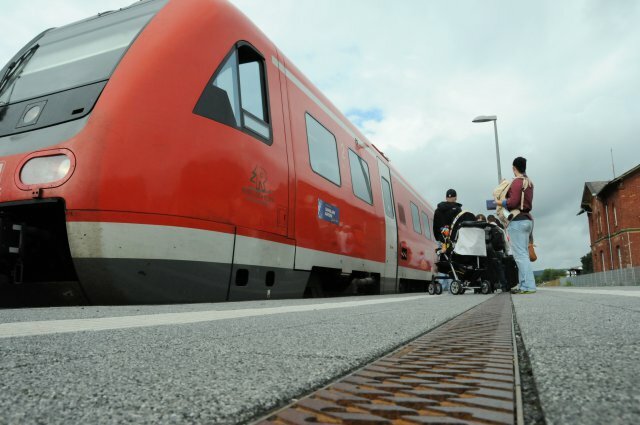 Travelers board a train in Vilseck, recently. Taking the train can be a viable, efficient option when traveling in groups or when the winter weather sets in. Photo by Jeremy S. Buddemeier. VILSECK, Germany – Living in Europe for the past four years, I’ve come to the realization that some cultural stereotypes exist because they’re true: Americans are loud in public and they really do love their cars. But recently I’ve begun to leave my car in the driveway and haven’t looked back. The train gets me there in a reasonable amount of time and the experience is much more pleasant than white-knuckling it on the autobahn. The train is especially useful when I have visitors in town and in the winter, when driving can be dicey and painstakingly slow. The key to car-free European adventures is knowing your options. Though it sounds easy enough, simply buying a ticket, when combined with the language barrier and the not-so-consistent ticket machines, can be overwhelming. When all else fails, ask the experts. Although they tack on a two-euro fee, Deutschebahn (DB) agents in the train stations can help you find the best fare. The fee is a small price to pay when you consider the time you save. Locally, Wolfgang Burczyk, the owner of Burex Travel Center in the Vilseck Train Station, has a nose for finding deals. He’s so adept, in fact, that DB conductors still call him with technical questions about tickets and pricing. “You have to know the crazy rules,” said Burczyk, who worked for DB for 25 years before starting his own company. His English-speaking staff thinks like a budget-minded traveler and often suggests flexible options you might not even have considered. For example, last week I started planning a trip to Brussels in early October. The best roundtrip deal I could find online for two people was 376 euros. Burczyk and his staff found a ticket for about 300 euros with faster connections. Then, when I stopped in to purchase the ticket, Alex Stolte, a seasoned member of Burczyk’s staff, found an even lower price when combined with a Bahn-25 card. In the end, I saved more than 100 euros and will be able to use the Bahn card to get 25 percent off all qualifying tickets I purchase for the next four months. The experts can help you get started, but several bread-and-butter deals are always available at the ticket kiosks. The following are by no means an exhaustive list, but should get travelers off on the right foot. Most people are aware of the flagship of train deals in Bavaria: the Bayern Pass. Perfect for day trips with a group of friends or even last-minute solo traveling, this ticket provides flexibility and fun. For up to 4 people on regional trains throughout Bavaria (and to Salzburg), good on weekdays from 9 a.m.-3 a.m. the following day; on weekends, valid from midnight until 3 a.m. the next day. One person: 25 euros (23euro+2euro fee); each additional person is 6 euros, so 4 people can travel all day in Bavaria, including S-bahn, U-bahn and buses, for 42 euros. (Not for ICE or IC). Suggested uses: A day trip to Dachau or Munich’s biergartens; a leisurely jaunt to Salzburg or wine-tasting weekend in Wuerzburg. Hint: If you use the Bayern for an overnight visit Salzburg, consider buying your return Bayern Pass at the same time (you can specify your return date at the kiosk), as not all ticket machines in Salzburg sell the Bayern Pass. Same stipulations as the standard Bayern Pass except it’s good from 6 p.m. until 6 a.m. the next day (and until 7 a.m. on Saturday morning – 6 a.m. if it is a holiday); 22 euros, 2 euros for each additional passenger up to five. The Friday night Bayern is perfect for a late night in Nuremberg. Travelers can take the first train Saturday morning, which leaves Nuremberg at 5:30 a.m., and be back in Vilseck by 6:20 a.m., before the ticket expires. Caveat: Bayern Passes apply to regional trains (not ICE) and your train must depart after 9 a.m. on weekdays. In addition, always ensure your train will arrive before your ticket expires, and don’t forget to write your name on the ticket. Lesser known than the Bayern Pass, but probably a better deal, the “Day Ticket Plus” is a great deal for travelers who live near stations in Freihung, Vilseck or Amberg. Two adults and up to four children under the 18 years old can travel all day for 19.10 euros. As an added bonus, if you purchase the ticket on Saturday, it’s also valid all day Sunday, as well. Major cities in the VGN network include Nuremberg, Bamberg, Bayreuth and Rothenburg ob der Tauber. Weiden and Regensburg are not included, but you might consider driving to Freihung to take advantage of this deal. Suggested uses: Saturday overnight trip to Rothenburg ob der Tauber’s Christmas market. When traveling outside of Bavaria, four standing tickets stick out. The name says it all. The Quer-durch-Land, or “across the country” ticket allows travelers access to all regional trains throughout Germany for one day, Monday-Friday. Like the Bayern Pass, it’s good for up to five people; 44 euros for one person, 6 euros for each additional traveler, so five people can travel all day around Germany for 68 euros. Similar to the QDL, but for a flat fee of 42 euros; good for up to five people and valid on Saturdays or Sundays, from midnight until 3 a.m. the following day. Bridging the border between Germany and the Czech Republic, the Bay-Boh ticket operates like the Bayern Pass, but also includes several major Czech cities, including Cesky Krumlov, Plzen, Karlovy Vary and Ceske Budejovice, where the precursor to Budweiser is brewed. Prague is not included for this ticket. Cost is 28 euros for one person, 5.60 euros for each additional up to five; good on weekdays from 9 a.m. until 3 a.m.; on weekends, from midnight until 3 a.m. the next day. Suggested uses: Group trip to Karlovy Vary or Cesky Krumlov. Considering that it takes about 4 hours to drive to Cesky Krumlov, and the train can get you there in 5 hours, it’s not a bad option. Consider buying your return ticket at the same time (you can specify your return date at the kiosk), as not all ticket machines in the Czech Republic sell this pass. Bahn cards are a fantastic deal for travelers who use the train frequently, but often the Bahn card proves its worth on the first purchase. Before purchasing a ticket to travel outside of Bavaria, ask about how getting a Bahn 25 or 50 would affect the price. Bahn 25: Travelers get 25 percent off all regular and saver fares; cost is 62 euros for one year. DB often publishes trial offers, like a Bahn 25 card for 29 euros that is valid for four months. The 25 percent discount does not apply to special offers like the Bayern Pass. Bahn 50: Travelers receive 50 percent off all regular fare purchases (but not saver fares). According to Stolte, this card provides flexibility and efficiency, and is best for travelers who use the train several times each month outside of Bavaria. Although there’s no substitute for good advance planning, many of the standing ticket offers in Bavaria provide flexibility for the spontaneous traveler. Taking the train offers several benefits and can even be a viable, inexpensive option when traveling in a group. Sure, in some cases a car will get you there quicker, but getting there faster isn’t always the best way to travel.